"Thine is the glory, risen, conqu'ring Son; Endless is the victory, Thou o'er death hast won." Here we see a incident so extraordinary that these people who sees it can only find one possible explanation: "God has visited His people!" (v.16). To this incident there has been a lot of witnesses - it's like it was on Lukas heart to outline this in this passage here: - He was accompanied by a large crowd and His disciples were going along with Him (v.11b), a sizeable crowd from the city was with here (v.12b). With that it would soon have been denied by a lot of people, if this that the disciples preached had not happen. If we could only believe what is written, then death would not be such a big case anymore - because, as Paul says - the sting of death is taken out (1 Cor.15:55) and it is called: "Death is swallowed up in victory" (1 Cor. 15:54). Hear this strong expression: Swallowed! This is exactly what was prophesied by the prophet Isaiah among others: "He will swallow up death for all time." (Is. 25:8). "He will..." This is actually attached to one specific person - and it is Him who meets this funeral procession from Nain. - "For all time" - as Isaiah prophesied - "Thou o'er death hast won." Outside - and without - Him, death is - yes, it is exactly death, by that very fact that He - and no one else - is the Life. (John 14:6). Jesus is God's word to the world (us) - Jesus is God's testimony. By Him - His word, and His deed, He has spoken and testified. We were going to learn about God by Jesus. Therefore Jesus did so many powerful deeds which confirmed His power, and His good will for us. - And also through the apostles among the heathens who never had heard this before. - But that becomes completely wrong - as some people think, and claims - to imagine that Jesus was come to take sickness and need away from us in this world. He showed by this wonder His power, but there is many a grieving - and believing - widow, both on Jesus time and later, who has cried as they followed their only child to the grave, without Jesus intervene like this. We know that! But what this tells us - for comfort for those who has to follow one of theirs to the grave - that is that there is a God who has compassion (V.13), and also power over this strong enemy. - Death is not the end. We can not call on what is not, and say: Be! But God can! Jesus rises this boy from the dead - and what do you see? What are you focused on? The wonder! A dead person is rised to life! Wow! But do you see the main message in this? If Jesus do not do this with you, you will stay as dead as the dead man who was being carried out of Nain this particular day! This is a serious message to you! It concernes life or death! Then it is not the signs and wonders that comes in focus for you, but Jesus Himself! He becomes the goal, and not only a means to an end. "A dead man was being carried out...." (v.12). Yes, we all know this so well. - What we are not so conscious of, is that we are all like these dead ones, who is over time carried to the grave. Moses describes it like this: " For soon it is gone and we fly away." (Ps. 90:10b). In other words in haste, seen from the eternal perspective: "- In the morning it flourishes and sprouts anew; Toward evening it fades and withers away." (Ps. 90:6). - One day! This was how the situation was for all of us, till the day that Jesus stopped the "procession" and said: "Arise!" You arose - you became living and happy - a joy you never before had experienced - the joy of life - the joy of heaven - Jesus joy - and you joined with Jesus. And, as it says here: "The dead man sat up and began to speak." (v.15). Are you alive - then you will speak - as long as your vocal cord is not sick or damaged in any way - and Jesus do not give birth to mute children - they have the testimony in their heart. But we must add something here: It was according to the Scriptures word not this day - that day, or time, we started believing - He changed our terrible situation, but the day He completed the deed here on earth, which from eternity was ordained in the Trinity heart of God - to save us by His life and death, by His fulfillment of the law and His death on the cross! So many things happen in life - and long periods can appear as going through an endless, desolate desert where nothing grows, but it is completely abnormal that a child of God does not at all know this salvation joy and therefore also need of witnessing! No, as sinful and dead and cold as I am, you can not expect something like this - some people say. - But it is deceitfulness in the spirit that is the reason for this - one does not really want anything different - one enjoys having Jesus on a certain distance. But He is not dead He who has taken care of you, and given His Spirit in your heart? Isn't He a living Savior? "Fear gripped them all, and they began glorifying God," we read. (v.16). It wont necessarily get this dramatic when a sinner is woken up, gets a new life in Jesus, and starts witnessing, but as soon as someone is reborn and the wonder has happened, there will be an impact around them - and the word about Him comes out. When it comes to the bodily death, God can raise up from that - the Scripture testifies about that many times - but God can also use death itself for something good. By a incident a missionary couple could not get through to the natives, as the natives looked at them as supernatural people, or half gods - who could not possibly understand their conditions. - But when the missionary couple lost their newborn baby, and the natives saw their sorrow and tears - their hearts opened up for the message they taught, and many "dead" became resurrected as a result of that. This is how the newborn baby serve God and his fellow-beings far beyond what many a 80 or 90 year old could have managed. We must never put up fences for the Lords work! We also have to bow for His word many a time: "What I do you do not realize now, but you will understand hereafter." (John 13:7). "God has visited His people," they said (v.16). Yes, more than anyone of them could grasp there and then - because they say: "A great prophet has arisen among us" (v.16), while the truth was, that it was Himself who stood there. Just as He had promised to this people through the prophets: "Be silent, all flesh, before the LORD; for He is aroused from His holy habitation." (Zech. 2:13). Yes, He left His habitation and descended down here, and since then He has been here. He is also the one who comes to you through this word, and testifies to your heart: I have swallowed death! I am the resurrection and the life! So even if you have to carry some of your own to the grave, or have to meet it yourself, it wont end there. But look, without Him everything is meaningless, and the death is the crowning glory. This one who came to free us from all misery - also the death, the last enemy - He has been (and is) persecuted, and at last rewarded with death. This is how blind the human being is in his spiritual death, that it persecutes and kills his only hope to be rescued. - But God, who turns everything for good for those who get saved - He also turned this Jesus death - this greatest sin man could commit, to the greatest blessing - yes, to what we are saved by, the blood of Jesus Christ. This was how mans cruelty, and Satan himself, serve those who would get saved. Jesus meets a dead person here, and leaves him alive. - No one else holds this power under heaven, "For just as the Father has life in Himself, even so He gave to the Son also to have life in Himself." (John 5:26). And: " For just as the Father raises the dead and gives them life, even so the Son also gives life to whom He wishes." (John 5:21). He is the Life! - And the life has conquered! Listen to that, and come to Him! First of all, you have to think about this spiritually. Of course it would have been great if Jesus had resurrected one of our beloved dead ones, but that is still little compared to the spiritual resurrection, that lasts forever. We should not either think like Martha - that "I know that he will rise again in the resurrection on the last day..." (John 11:24). No, "I am the resurrection and the life," Jesus says. "He who believes in Me will live" - that means; to stay living - "even if he dies. (John 11:25). They live now! As Jesus said to the robber on the cross: "Truly I say to you, today you shall be with Me in Paradise." (Luke 23:43). He was going straight from death of the cross into Paradise - while the body was laid in the grave to the day of resurrection. "Absent from the body and to be at home with the Lord." (2 Cor. 5:8). This widowers son just got a delay on this road we all have to walk, if not Jesus comes back before this our day - when it shall be said about us: "Yes, now is also him/her dead!" Does the world need Jesus? Do you need Jesus? The answer is obvious! - But man loved the darkness before the light, because their deeds were evil. (John 3:19). 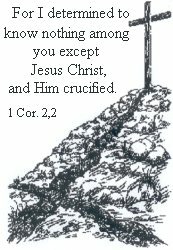 This is how sin unfortunately still can separate us from God, if we deliberately turns our eyes away from the cross of Golgotha - its necessity and its incredible effect.